History buffs looking for a well-run Pittsburgh hotel should head straight for The Priory, a former Benedictine monastery that retains architectural detail evocative of 1880's priory days, but with elegant, modern rooms and high quality service. Rooms range from cozy single bed rooms to apartment-like suites. Many have views of Pittsburgh's city skyline; others overlook trees and a fountain in the courtyard. Original architectural features (high, paneled windows, mantlepieces and wainscoting) and wrought iron or dark wood bedsteads bring history to life, with essential modern additions like high quality mattresses and bedding and free wireless. The Priory's complimentary shuttle takes you central city locations: business meetings, dinner out on the town, or a Pirates' game. Complimentary expanded continental breakfast is served daily in the orignal Refectory. The Monk's Bar serves microbrews, wine and cocktails (this is your chance to drink a "Monktini" in a former monastery!) and a light snack and sandwich menu. Gathering spaces for groups from 5 to 350 include the monastery's orignal Refectory and a grand ballroom. 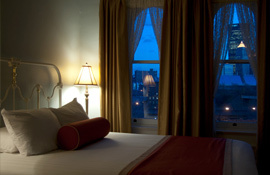 The Priory is a downtown Pittsburgh hotel about 25 minutes from Pittsburgh International Airport. Cancellations must be made 24 hours prior to arrival.